A riotous tale of love and lust, valor and villainy on the Mexican frontier of the 1930s. Robert Hough’s vivid and wildly imaginative novel takes us to 1931 Mexico and Corazón de la Fuente, a war-ravaged border town where the only enterprise is a brothel in which every girl is called Maria. Enter, from north of the border, Dr. Romulus Brinkley, inventor of a miraculous “goat gland operation” said to cure sexual impotence. When Brinkley decides to build a gargantuan new radio tower to broadcast his services throughout the United States, he chooses none other than Corazón de la Fuente for its site. The town’s fortunes change overnight, but not all to the good – word of the new prosperity spreads, and Corazón is overrun with desperadoes and mercenaries itching to reopen old wounds. Worst of all, Dr. Brinkley has attracted the affections of the town’s most beautiful citizen, Violeta Cruz. But with the help of a motley band of allies, Violeta’s spurned fiancé, Francisco, decides to fight back. 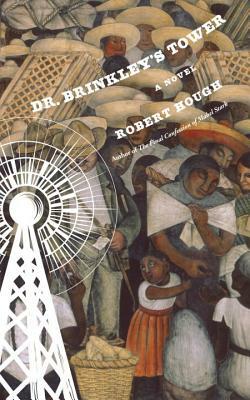 Inspired by the monstrous shenanigans of a real life American con man and peopled with unforgettable characters, Dr. Brinkley’s Tower captures a young Mexico caught between its own ambitions and the designs of its wealthier neighbor to the north. Robert Hough is one of Canada’s most critically acclaimed writers and has been published to rave reviews in fifteen countries. His debut novel, The Final Confession of Mabel Stark, was shortlisted for the Commonwealth Writers' Prize and was a New York Public Library Best Book. His second novel, The Stowaway, was a finalist for the IMPAC Dublin Award and chosen by the Boston Globe as one of the top ten fiction titles of the year. His most recent novel, The Culprits, was a finalist for the Trillium Book Prize, the Commonwealth Writers’ Prize, and the Rogers Writers' Trust Fiction Prize. He lives in Toronto.